Following the tip from other RV-12 builders, work continues in the plans with the jump to section 28. In section 28 the builder is constructing the fuel system by creating aluminum pipes with flared ends from rolls of soft aluminum tubing. The flared ends will connect to aviation AN fittings. With all the Holliday hustle and bustle, not much big progress has been made overall, but there have been a few productive small work sessions in the last few days. As with most things in aviation, specialized tools are often required … and the fuel system is no exception. In particular, the flaring tool required is not the standard 45 degrees as used in automotive or plumbing. Don’t even consider running out to the local auto parts supplier or big box hardware store to purchase a flaring tool for aircraft fittings. Aircraft AN fittings used in the fuel and brake systems are 37 degrees and share the same angle as commonly found on fittings for hydraulic lines and NOT the typical 45 degrees used in automotive or plumbing. 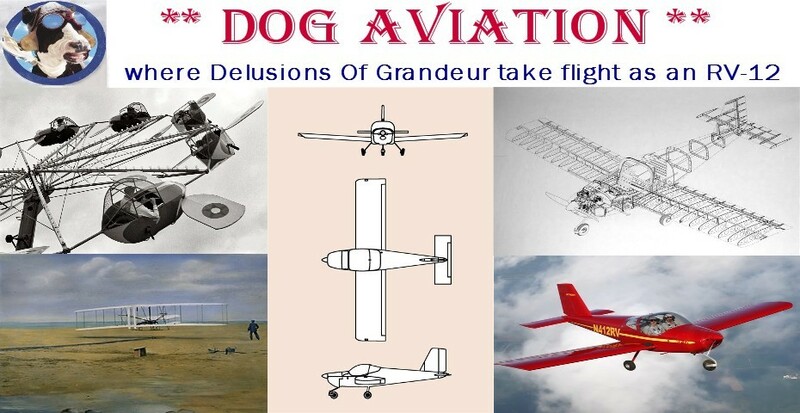 The DOG Aviation procurement department purchased a Parker Rolo 37 degree flaring tool because it appears to be well received within the homebuilt aircraft community. The Parker flaring tool is easy to use and has two rotating dies (one upper, one lower) to accommodate a wide variety of tubing sizes. Just spin the dies around so the size of the upper and lower jaws match the tubing size to be flared and you are ready to get your flare on. The Parker Rolo 37 degree flaring tool. Both jaws of the flaring tool set for 3/8” tubing - the depth stop can be seen in front of the lower jaw. The first RV-12 fuel line to be constructed is the fuel line from the tank to the fuel pump. After the 3/8” aluminum tube was uncoiled on the workbench and cut with a tubing cutter, a 2x6 was used to apply pressure to the tube against the workbench while rolling it back and forth under the 2x6 … this helps straighten the tubing. Once reasonably straight, the aluminum tube was filed smooth and placed into the Parker flaring tool until it hit the stop … which moves away as part of the clamping process. Aluminum tubing placed into the Parker flaring tool until it rests on the stop. The center cone of the flaring tool should be lubricated … I found a light coating of white lithium grease seemingly works better than oil. When flaring tubing using a flaring tool, don’t over tighten the center cone. This is one place where less is more … as soon as you feel solid resistance while forming the flare, STOP! Over tightening can create scoring, so it should be avoided. Using the Parker Rolo 37 degree flaring tool to create a flare on a section of fuel line. Formed 37 degree flare on the end of the aluminum tubing. After flaring an end of the tube, the plans instruct the builder to bend the tubing to match a 1:1 drawing on the prints. At this point, an AN819-6D sleeve needs to be slid onto the tubing because after the tubing is bent, the sleeve CAN NOT be slid onto the tubing around the bend… however, the nut will easily slide around a bend. The Imperial 470-FH triple head tubing bender. This is where I ran into the first speed bump. The bend to be created per the plans was so close to the flared end that the tubing did not reach the hook on the Imperial tubing bender (needed to secure the tubing during the bending process). Red marking on the tubing is where the first bend is to start. After placing the red mark at the 0 location (hidden), note the tubing was behind the hook on the bending tool … not good. The hook needs to hold the tubing during the bending process. Getting creative ... after pondering various solutions, the one that seemed easiest and most appealing to me was to insert a 1/4” pin punch into the tubing and use the punch shaft as an extension to catch the jaw on the tubing bender. The sharp end of the pin punch was covered with a few turns of masking tape so it would not score the inside of the tubing and to also create a tighter fit centering the tubing on the punch shaft. The pin punch’s shaft was marked so it would not be inserted so deep into the tubing as to interfere with the bending of the tubing. A 1/4" pin punch with blue tape and red depth mark inserted into the tubing so the pin punch would catch the tubing bender’s hook and secure the tubing in place while bending the tubing. As luck would have it, I dropped the flared tubing onto a tool which placed a small dent on the flare so decided it best to start over and just make a new one. Checking the completed first 90 degree bend of the replacement tubing against the 1:1 drawing in the plans … so far so good. The remaining bends were uneventful and the bending was stopped just prior to making the last 90 degree bend which goes up to the fuel tank. The reason for this is because of a modification being incorporated into the RV-12 build … more on that in the next post. First three bends completed and the fuel tank to fuel pump line is conforming nicely to the 1:1 drawing in the plans.